As an eight year volunteer at the Seattle Humane Society in Bellevue, I’m very excited I am about this past weekend’s ground breaking ceremony for a new state-of-the-art facility. Staff and volunteers do an amazing job providing animal shelter, adoption, vet services, education, food bank donations and more for dogs, cats and critters – and the people in their lives – in a dated facility that is long overdue for replacement. I volunteer in the Dog Behavior and Socialization program, walking and training dogs currently available for adoption and working with those that still need to improve their manners before heading to their new home. Its an incredibly rewarding experience and every week I’m amazed at the work the staff and volunteers do and am touched by each incredible animal I work with. Every animal there has a story, but how they got there isn’t as important as the new chapter written when that dog, cat or critter finds its new forever home. SHS is an independent non-profit organization with a 97% save rate and no time limit for animals in their care. Its a worthy organization to support, whether you’re looking for a volunteer opportunity, a cause to support or a new furry member for your family. It will be a little crazy on campus during construction, but the adoption office and animal adoption dorms will remain open. Don’t let a little construction dust keep you from finding a new dog to walk downtown or a cat to fill the void on your condo window sill. 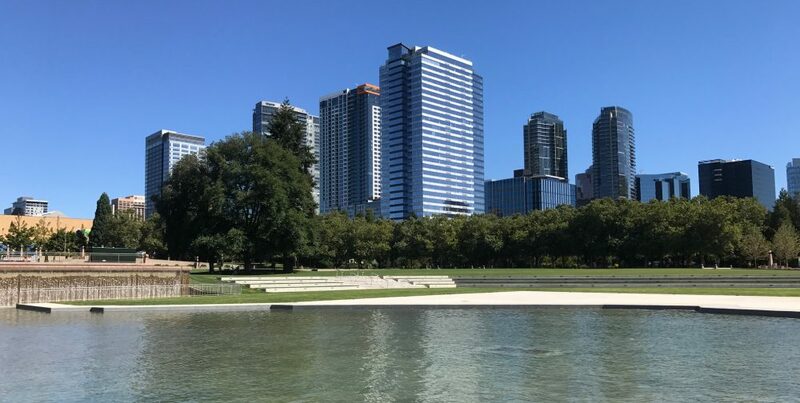 2015 was another strong year for downtown Bellevue condominium market values. The 2015 median sales prices were up 7.5% over 2014. Inventory, or rather the lack of downtown condo inventory, is expected to continue in 2016. At this writing there are 65 condominiums listed for sale in the 98004 zip code. Of those, 43 are remaining developer owned residences at Washington Square (on the market since 2009). In years past the average number of downtown condos available for sale was consistently well over 100. Since the first of the year 23 condos have sold and another 23 have sales pending (many on the market for less than two weeks). Buyers are absorbing new inventory as quickly as its available. People want to live downtown. There’s ample rental inventory available, but not everyone wants to rent, and with rents skyrocketing, not everyone can afford to rent. Interest rates are still at historic lows and aren’t expected to change much this year – definitely a plus for buyers giving them more buying power. Unless more condos come on the market in the coming months it could be another frustrating year of low inventory, high buyer demand and multiple offers. Regardless of how you feel about the changes downtown, or even drones, click on the link above . . . this Bellevue.com video is fantastic . . . a great reminder of what a beautiful place we live.